Since the time man set foot on earth, traveling short and long distances is one of his basic needs. In early days, horsedriven carriages were used as means of travel and transportation. The ardent need to travel fast and save time gave rise to the invention to automobile; a carriage which propels without any external source. And therefore in early days, automobile was called as “Horseless Carriage”. These Horseless Carriages were driven by engine. Thus invention of auto-engine marked the dawn of the automotive era in the world. Most cars in Europe were built by hand in the early 1900s. As the auto-engine improved, the automobile industry also progressed rapidly. Although, a French engineer “Alphonse Beau de Rochas” had conceptualized a four-stroke cycle engine in 1862, it was the German engineer “Nicolaus August Otto”, who first invented a complete four-stroke internal combustion engine, which run on gasoline, commonly known as petrol, in 1876. The first automobile was powered by Otto gasoline engine and invented by “Karl Benz” in Germany in 1885. This engine was considered more efficient on fuel and burn cleaner than the two-stroke cycle engine, which is also an internal combustion engine but completes its combustion cycle in two strokes. Ever since then it has been the most commonly used engine. And used in cars, vans and trucks, and in generators for the industrial purposes. 1. The Intake Stroke also called Induction Stroke. 3. The Combustion Stroke, also called Ignition, Power or Expansion Stroke. The four-stroke cycle begins when the piston is positioned at the uppermost point in the cylinder, called as TOP DEAD CENTRE. During the first intake (downward) stroke of the piston, a combustible mixture of fuel (gasoline) and air is drawn into the cylinder through the spring loaded inlet valve, in most cases, the valves both inlet and outlet are placed on the top of the cylinder. The inlet valve after drawing mixture closes, and the piston reaches to its lowest position which is called BOTTOM DEAD CENTRE. The second upward stroke compresses the fuel-air mixture, already present in the cylinder. This fuel-air mixture is then ignited usually by the spark plugs at the top of the compression stroke. The ignition produces expansion by the burning gases, which results in forcing the piston downward for the third stroke, also called “Power Stroke”. The fourth and the final upward stroke, the “Exhaust Stroke” evacuates the burned (exhaust) gases from the cylinder through the exhaust valve, and finally throw out in open air through the exhaust pipe. In a four stroke engine, each piston must move back and forth twice and stop four times to complete the cycle. 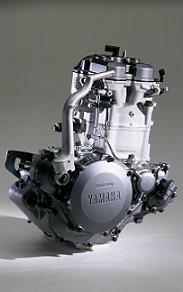 A four stroke engine produces one power stroke every other time a piston moves down its cylinder.